Mould, condensation, house dust mites and cold are major causes of ill health and disease across the world’s temperate and cold zones. The Passivhaus approach to low energy building offers a solution to poorly ventilated homes and associated health problems. As well as calling for stringent airtightness and energy efficiency, Passivhaus also has a strong focus on indoor air quality and comfort. 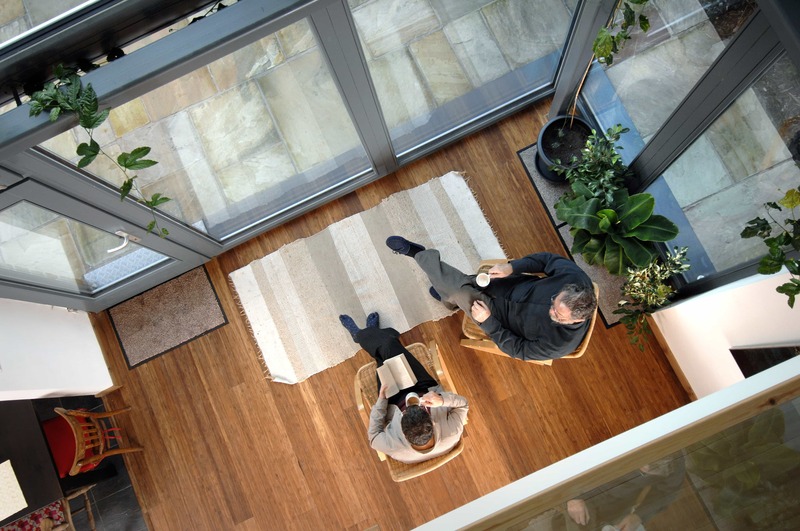 By combining careful attention to the building fabric with mechanical ventilation using heat recovery systems, Passivhaus delivers comfortable, very low energy homes. The Passivhaus approach calls for controlled ventilation, as opposed to the inadequate ‘uncontrolled ventilation’ currently available in many homes in northern Europe, America and Asia, southern America, New Zealand and other temperate and cold areas. The key Passivhaus principles are super insulation, stringent levels of airtightness, minimisation of ‘thermal bridging’, optimisation of passive solar gain and mechanical ventilation with heat recovery. Excellent air quality inside buildings can only be achieved if ‘used’ air is regularly replaced by fresh air and air movement through the building is managed. In conventional housing, replacement of used air with fresh air is often inadequate and unreliable, leading to potential health problems including asthma and other respiratory problems. Humidity can often rise to unacceptable levels, potentially leading to condensation and ultimately mould formation. Mould growth caused by condensation can exacerbate these problems. Chronic damp can cause problems in joints such as arthritis. Other air impurities, for example dust, spores and chemicals released by modern furnishing and decorative materials, may build up in indoor air to high levels, exacerbating conditions such as asthma, or leading to the condition known as ‘sick building syndrome’ (SBS) which can manifest as sensory irritation of the eyes, nose and throat, neurotoxic or general health problems, skin irritation, nonspecific hypersensitivity reactions and odour and taste sensations. In northern Europe, many of us are accustomed to uncontrolled ventilation. Many buildings receive fresh air as ‘draughts,’ through gaps in the building fabric. The downside of this is that ventilation fluctuates greatly and energy is lost from the building. There is discomfort from draughts and unwanted air movement, and condensation and mould in the building fabric can occur as warm air escapes through gaps. In more airtight buildings with fewer gaps in the building fabric, opening windows and doors might be used to achieve air exchange, also known as ‘purge ventilation.’ However, studies have shown that opening windows even twice a day would not be sufficient in such cases. In a modern, fairly airtight buildings, to achieve an adequate air quality one would have to open the windows wide for five to 10 minutes every three hours, even at night. Background trickle ventilation is the key approach in current building regulations in the UK. This is a pretty hit and miss approach, even at the airtightness levels currently in these regulations, while at higher levels of airtightness it is generally recognised to be woefully inadequate. To ensure excellent air quality for building occupants, Passivhaus design puts great emphasis on the need for controlled ventilation with regular, guaranteed and adequate air exchange. This is achieved through mechanical ventilation with heat recovery (MVHR) systems, also known as comfort ventilation. The level of airtightness in Passivhaus buildings is such that gap air exchange or opening windows would be not be sufficient for good indoor air quality. MVHR works by extracting the air from the polluted sources, for example the kitchen, bathroom, toilets and utility rooms, and supplying fresh air to ‘living’ rooms like bedrooms, sitting rooms and studies. Extracted air is taken through a central heat exchanger so that heat from the extracted air helps heat the fresh air going into the house. The heat recovery element of MVHR is very important as it recovers heat from the exhaust air and transfers it back into the supply air without mixing the air flows. Modern MVHR technology allows a heat recovery rate of between 75 and 92 per cent. This is possible due to counterflow heat exchangers and energy-efficient fans, so the recovered heat energy is eight to 15 times the electrical energy consumed. An MVHR system provides a constant supply of fresh air, maintaining indoor air quality whilst being practically imperceptible. The Passivhaus standard specifies MVHR systems provide an air supply of around 30m3 per hour, per person. MVHR systems are carefully designed and calibrated to ensure the moisture content of the air is neither too wet nor too dry for occupants. Critically for occupants’ health, it reduces indoor pollution, such as dust, pollen and diesel particulates, to safe levels by adding filtered fresh air, minimising impurities coming from the outside as well as the inside. MVHR systems are suitable for both newbuild and existing buildings, and work best in buildings with high levels of airtightness and insulation.